Shaikh Altaf Ali, Secretary, Ministry of Health & Family welfare, Government of Bangladesh and Prof. Dr. Shah Monir Hossain, Director General, Health Department visited ongoing activities of YPSA-GFATM Package#902 program at Cox’s bazaar on 26 February. They attend a session titled “Life Skills Education (LSE)” organized by YPSA’s strategic Partner ‘PHALS’. The LSE session for the young people is organized regularly aiming to raise awareness on HIV and STDs among the young people. 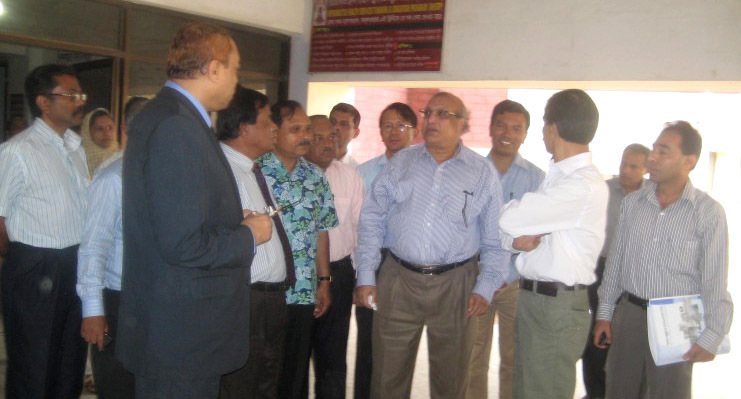 Honorable Secretary also visited Youth Friendly Health Service Center (YFHS) at Cox’sbazar Sadar Hospital. Dr. Sakhawat Hossain, Supernatant of Sadar Hospital, Coxs bazaar, Dr. Pu Chaw Nu, RMO of Sadar Hospital, Cox’s bazaar, Kazi Amdadul Hoque, Manager (Advocacy) save the Children-USA, Mr. MAhabubur Rahman- Focal Person, YPSA-GFATM# 902 & Director (Field Operation) YPSA, Jasim Uddin – Program Officer,YPSA-GFATM#902, were present among others.